Shapinsay Show president Frazer Leslie with this years cattle champion, his Limousin cross yearling heifer. Today’s Shapinsay Show saw a double win for this year’s show president, Frazer Leslie from Odinstone, as two of the cattle he showed went on to take the overall champion and overall reserve prizes in the cattle show. 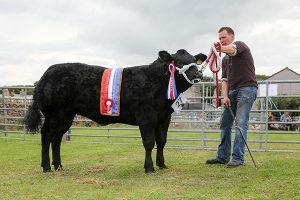 With excellent weather conditions for the show, it was Odinstone’s Limousin cross yearling heifer calf that came out on top in the cattle competition. The calf was sired by the bull Livet Hustler and was from a Limousin cross cow. The reserve was a January-born, AI, Limousin cross stot calf by the Limousin bull Lodge hamlet and out of a Limousin cross cow. The show’s horse section saw a double win for the Evans family, from Quoybanks. The overall winner was Greenburns Dvorak, or Lutz, a seven-year-old, Trakehner cross French Thoroughbred. 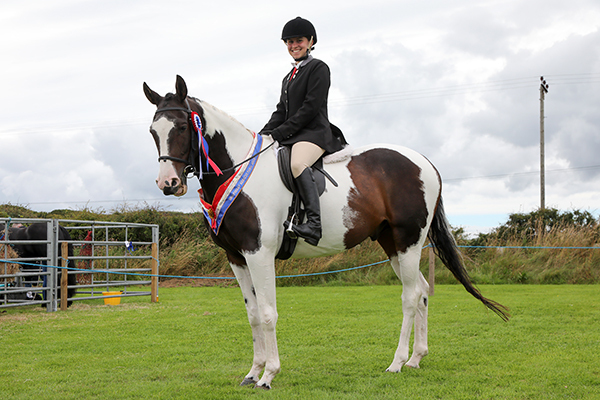 This year’s champion horse, Greenburns Dvorak, ridden by Rachel Evans. Meanwhile the sheep section’s top prize was taken by a two-shear Texel ewe shown by Emma Rendall, from Braefoot, and the top goat at the show was a Rosie, an April-born homebred Saanen cross Anglo-Nubian female. The Shapinsay Show’s champion poultry exhibit was shown by J. Hall, from Lochend, and was a six-year-old micro Pekin cockrel. The dog section was won by a Border Collie called Benjamin Franklyn, shown by Andy and Val More, Veantro, and the show’s top pet was a rabbit called Theadora shown by Bethany Hall, Lochend. For a full report, along with reports from the three other shows left in Orkney’s shows calendar, see next week’s edition of The Orcadian. For reports from this year’s Sanday and East Mainland shows see this week’s issue of The Orcadian.